Don’t you just love how, when you spread the tines of the Vintage Trinkets brad, it looks like leaves on the flower! 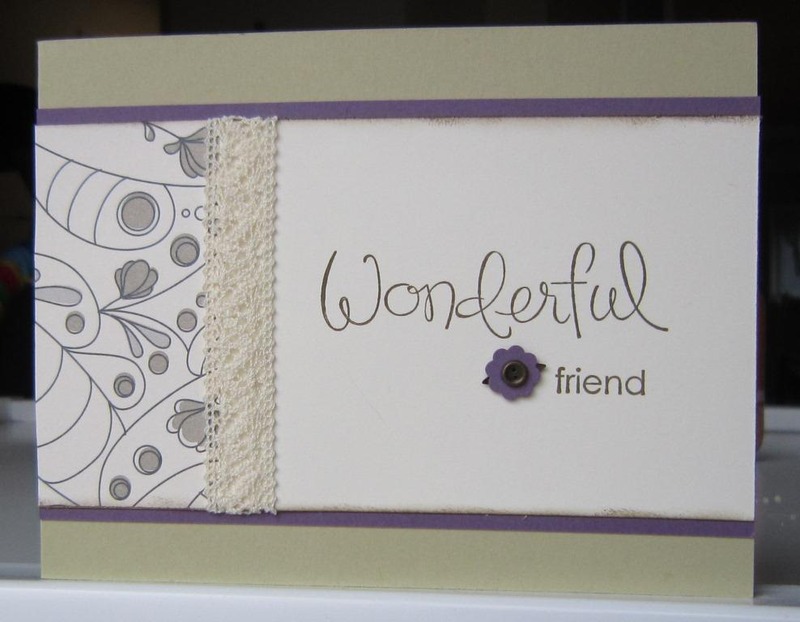 I kept the card simple with the muted colors and let the designer paper and embellishments do the work. The only other extra touch I added was to sponge Soft Suede ink along the long edge of the Very Vanilla/Elegant Soiree paper. What do you think? Would this work for a non-traditional Valentine? Just a reminder that Monday is the last day for my free shipping offer. Kick off Sale-a-Bration time with lots of free goodies and an even bigger savings with free shipping! Call or email me your Sale-a-Bration order by Monday night and I’ll hook you up with free shipping. That’s at least a 10% savings on your order on top of all the free Sale-a-Bration products. 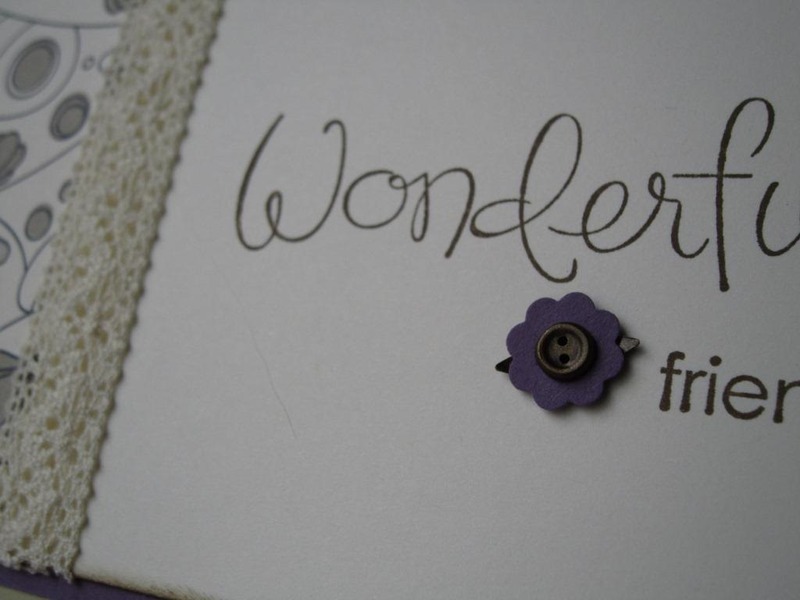 Plus, Stampin’ Up! is shipping things out super fast right now so you could even have your order as soon as the end of the week! Email me at jennifer@nwstamper.com or call 650-209-5964 to place your order. I’m so excited to be doing a Valentine’s themed workshop next week and so I’ve been busy getting the cards designed and ready to go. I knew when we started talking Valentine’s Day, that I wanted to use this stamp set, Love You Much. So, this is one of the first cards I created for the event. Because there is one stamp that stamps the three different hearts at the same time and the Heart to Heart punch will punch all three out at the same time, this card can come together pretty quickly. 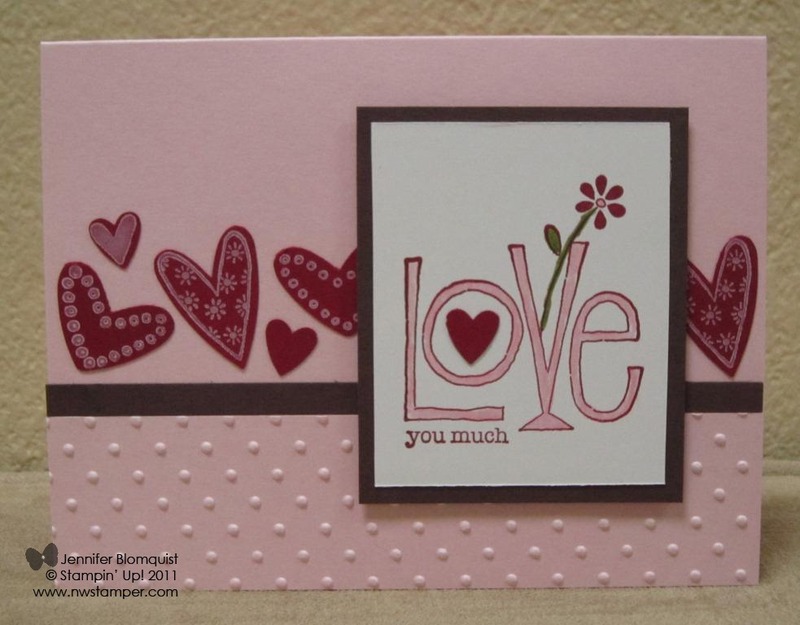 I stamped the Love You Much image in Cherry Cobbler and then went over the stem in Old Olive using a marker and then filled in the word Love with Pink Pirouette. To add a little extra fun texture, I also cut an extra piece of Pink Pirouette CS and ran it through the BigShot using the Perfect Polka Dots embossing folder. Then I just glued it straight onto the card base. Kind of fun, no? I hope folks at the workshop have a lot of fun with this card. If you are in the Bay Area and would like to make this card yourself, I’d love to show you and your friends during your own free workshop! Email me a jennifer@nwstamper.com to save your date. In a flurry of excitement, Sale-a-Bration has officially begun! Of course you can earn free stamps, but I love that you get options for other items like the Ice Cream Parlor Designer Paper and Quick Accents. I had gotten this paper pack during the preorder and the more I use it, the more I’ve now decided that I NEED the matching Ice Cream Parlor buttons and ribbon pack! 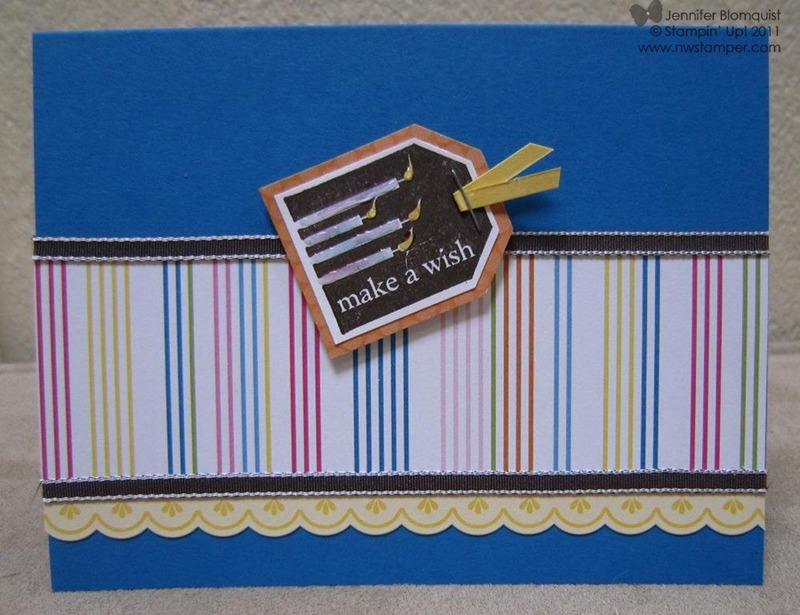 For this card, the striped designer paper, the Daffodil Delight scalloped border cardstock sticker, and the Peach Parfeit designer paper – all come as part of the Ice Cream Parlor DSP And Quick Accents Sale-a-Bration pack. I just added some Early Espresso taffeta ribbon, cardstock, and a staple to finish out the card. Seriously, this is a 5 minute card! If you are on my mailing list, you should have received the full tutorial for this purse in your inbox yesterday. If you didn’t, let me know! Not on my mailing list yet? Sign up here. I’ll even resend the copy of my email with this tutorial in it to folks who sign up in the next couple of days. Over the next week I’ll be sharing more Sale-a-Bration creations, so I hope you stop by again and check them out! Until then, happy stamping! Its here! The 2011 Sale-a-Bration period has started and that means tons of cute stamp sets, designer series paper, ribbon, buttons, digital downloads, and even décor elements are ready to hop into your Stampin’ Up! order box and come home to you for free! Ordering – Earn free Sale-a-Bration items for every $50 you spend. There is no limit to how many you can earn, and with over 60 stamps sets from the main catalog also eligible to be earned during Sale-a-Bration, you have lots of options to choose from. 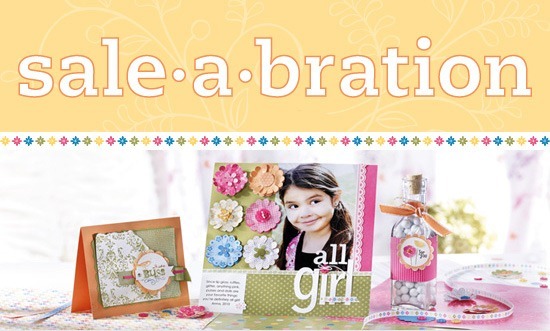 Hosting – Host a workshop or card party of $300 in sales or more and you’ll earn an extra free Sale-a-Bration item! Join My Team – Sign up to be a Stampin’ Up! demonstrator and not only will you be part of an awesome business and community, but you’ll also get one heck of a deal! Get 15% off the cost of your starter kit – that’s less than $150 for over $330 worth of product! 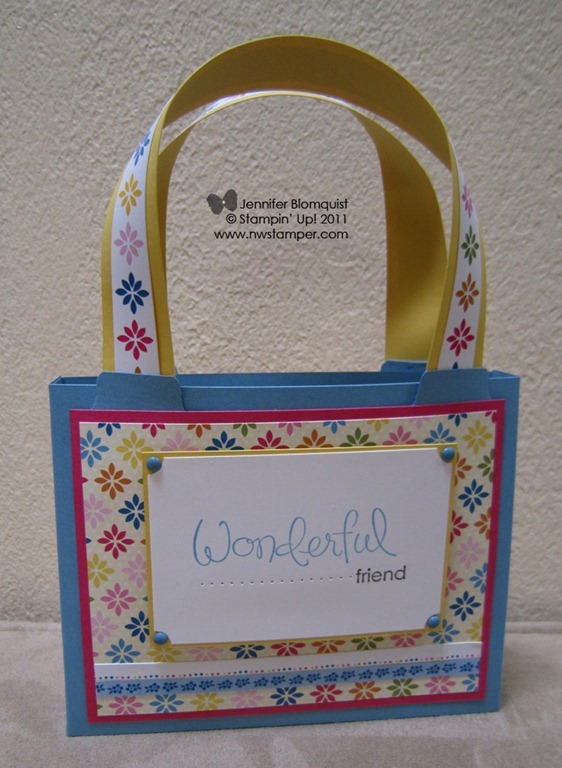 AND you’ll also get a bonus bundle with and additional $50 worth of stamping products! See what is all included here. To help make it easier for you to get your free Sale-a-Bration items even sooner, I am offering free shipping on all orders that qualify for Sale-a-Bration benefits through January 31st. Orders must be placed through me so that I can credit you the shipping costs. Call me at 650-209-5964 or email me at jennifer@nwstamper.com. Last Chance for Filled With Love! That’s right! 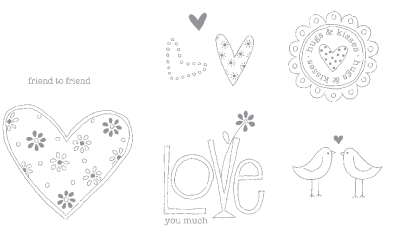 Today is the last day the Filled With Love stamp set and bundle will be available! So, if you were thinking of getting this bundle but hadn’t done it yet; don’t miss your chance. You can order now in the online store and until 11:59pm MST at which time it sails off to retirement. However, in the meantime I wanted to share with you some cards I made last night using Filled With Love. 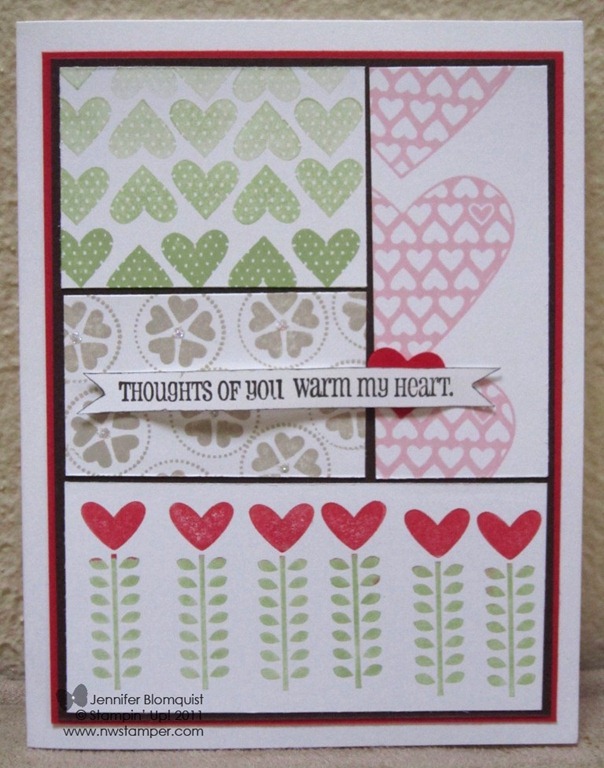 I had the idea of stamping the row of heart flowers along the bottom and then embossing while watching tv with the hubby. Unfortunately, that is where my inspiration seemed to stop. So, I got through the stamping and embossing, added the ribbon, and then didn’t know what to do. I put together the heart for the sentiment and added it; but I’m still not totally convinced. 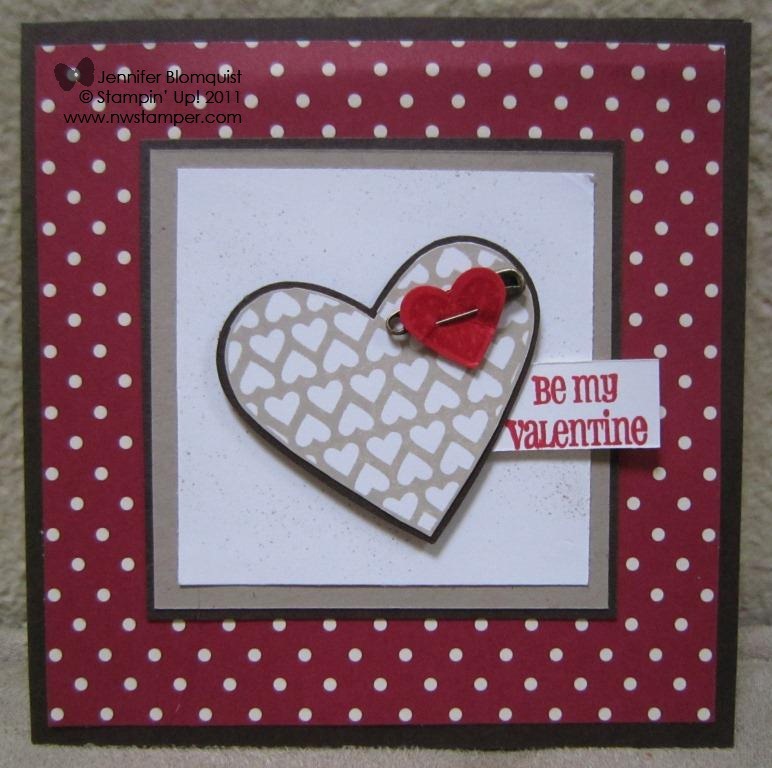 I love the fact that I used “Christmas” paper – the Deck The Halls pack – for this Valentine’s Day card. I also pulled out my Vintage Trinkets for the first time as well (the tiny safety pin). It looks kind of like an arrow through the little heart don’t you think? Finally, I had one more sentiment that I had created during all this playing that I though needed a home as well. I also wanted to use some of the other stamps in the set and so I created a “color-blocking” style card only instead of using different colored paper for the blocks, I used different stamp images from the set. Again, I think the jury is still out on this card but it sure was a lot of fun to make! Check it out in the online store! If you have any questions, just let me know and I’d be happy to help! I recently wanted to make a card for a stamping friend so I could show her the new, fabulous seam binding ribbon (seriously, I can’t get enough of this stuff right now – I love how it is delicate and soft like silk yet more opaque than organza.) So, I put together this sweet and simple card for her. The bow is not tied and instead the loops are held together by a rhinestone brad, which is then punched through the Crumb Cake cardstock. Had I been thinking before I added the bow, I would have loved to use my Color Spritzer and added some splattering of Soft Suede ink to the Crumb Cake cardstock first, but I guess I’ll have to save that for next time. So, instead I added some Bitty Buttons covering the matching shapes punched out of the Botanical Gazette designer series paper. Tip: When you are using matching paper shapes with clear buttons, I find I get the best results by adding a light layer of Crystal Effects to the back of the button and then using that as the adhesive to stick the button to the paper. You don’t need a lot of Crystal Effects, but you want just enough lightly cover the entire side of the button. This gives you a perfectly clear adhesive with out those weird shadows you can get with glue dots or tapes and other adhesives. 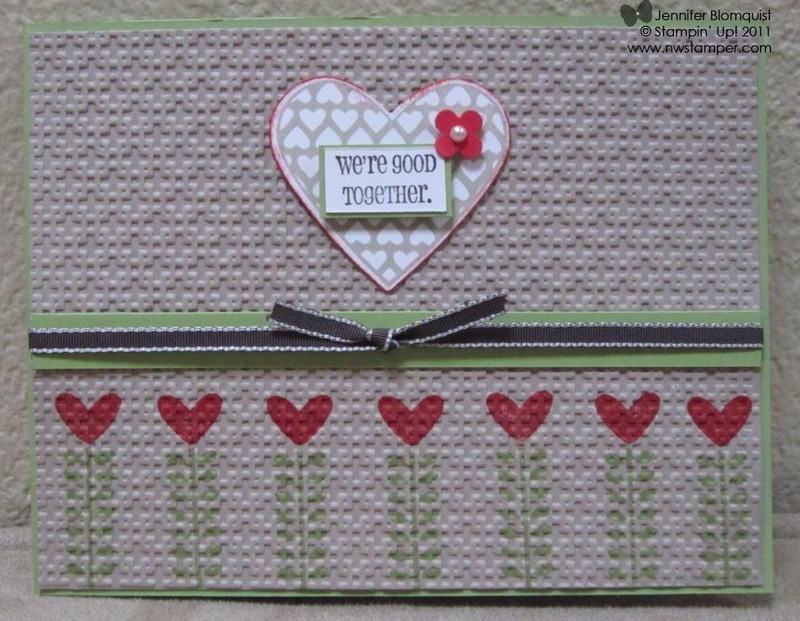 This card was centered around the pretty Rose Red Seam Binding ribbon. But I bet it would be great with the other 6 colors of Seam Binding ribbon. Which color is your favorite? See all the Seam Binding colors here in the online store.